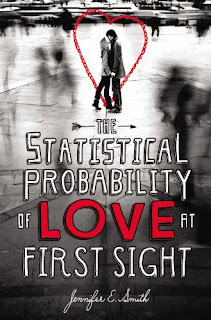 I read The Statistical Probability of Love at First Sight by Christmas tree light in one blissful chunk. I fell in love with the cover awhile back, because, well, love the font and the red on black and white, and the blessed not-a-single-word title. Honestly, they're few and far between these days, and they always snag my attention as a result. But I knew very little about it otherwise. Nevertheless, when it became available on NetGalley, I went ahead and downloaded it to my nook. I figured it looked to be a nice, sweet way to kick off the new year. A light romance about two kids who meet in an airport? I tend to get a bit anxious, a bit maudlin come the end of the holidays and the beginning of a new year. So it sounded like a perfect January read to me. Of course, I let it sit there for a bit, trying to finish up a few end-of-year reads. And then one late afternoon I found myself with a couple of hours to kill. I'm not sure what combination of stars aligned to create that little event, but I immediately plopped down on the couch in front of my Christmas tree and opened up this little baby. I didn't look up once until I was done. Hadley is on her way to her father's wedding. Against her will. To a woman she's never met. Despite the fact that he left her and her mother for a position at Oxford, England in general, and a woman named Charlotte, both her parents think she ought to attend his wedding. And so after much mutiny, she finds herself on her way to the airport. But as happened so many times in her dreams, she's late and misses her plane. Unfortunately, that poses as many problems as it solves. Now she's stuck in the airport waiting for the next flight to London, and she has that much more time to hash the whole painful debacle out in her head. Terrified of flying, she has both the wedding and the mode of transportation to dread. And then a small kindness. The boy across the way offers to watch her suitcase for her while she makes a trip to the bathroom. In fact, he does her one better and comes with her. They get a bite to eat and start talking about why they're both headed across the pond. Turns out Oliver is actually British. Studying at Yale, he's on his way back for a similar command performance. And an unlikely friendship is struck up on the one night of the year Hadley was most afraid of confronting alone. Of course, the flight only lasts a finite number of hours. And all too soon they touch down at Heathrow and must say goodbye. Just when they were beginning to really get to know one another. When she was little, Hadley used to sneak into Dad's office at home, which was lined with bookshelves that stretched from the floor to the ceiling, all of them stacked with peeling paperbacks and hardcovers with cracked spines. She was only six the first time he found her sitting in his armchair with her stuffed elephant and a copy of A Christmas Carol, poring over it as intently as if she were considering it for her dissertation. "What're you reading?" he'd asked, leaning against the doorframe and taking off his glasses. "Yeah?" he asked, trying not to smile. "What story?" "It's about a girl and her elephant," Hadley informed him matter-of-factly. "Yes," she said. "And they go on a trip together, on a bike, but then the elephant runs away, and she cries so hard that someone brings her a flower." Dad crossed the room and in a single practiced motion lifted her from the chair--Hadley clinging desperately to the slender book--until, suddenly, she was sitting on his lap. "What happens next?" he asked. "The elephant finds her again." "He gets a cupcake. And they live happily ever after." "That sounds like a great story." Hadley squeezed the fraying elephant on her lap. "It was." "Do you want me to read you another one?" he asked, gently taking the book from her and flipping to the first page. "It's about Christmas." She settled back into the soft flannel of his shirt, and he began to read. It wasn't even the story itself that she loved; she didn't understand half the words and often felt lost in the winding sentences. It was the gruff sound of her father's voice, the funny accents he did for each character, the way he let her turn the pages. Every night after dinner they would read together in the stillness of the study. Sometimes Mom would come stand at the door with a dish towel in her hand and a half-smile on her face as she listened, but mostly it was just the two of them. Even when she was old enough to read herself, they still tackled the classics together, moving from Anna Karenina to Pride and Prejudice to The Grapes of Wrath as if traveling across the globe itself, leaving holes in the bookshelves like missing teeth. And later, when it started to become clear that she cared more about soccer practice and phone privileges than Jane Austen or Walt Whitman, when the hour turned into a half hour and every night turned into every other, it no longer mattered. The stories had become a part of her by then; they stuck to her bones like a good meal, bloomed inside of her like a garden. They were as deep and meaningful as any other trait Dad had passed along to her: her blue eyes, her straw-colored hair, the sprinkling of freckles across her nose. Often he would come home with books for her, for Christmas or her birthday, or for no particular occasion at all, some of them early editions with beautiful gold trim, others used paperbacks bought for a dollar or two on a street corner. Mom always looked exasperated, especially when it was a new copy of one that he already had in his study. "This house is about two dictionaries away from caving in," she'd say, "and you're buying duplicates?" But Hadley understood. It wasn't that she was meant to read them all. Maybe someday she would, but for now, it was more the gesture itself. He was giving her the most important thing he could, the only way he knew how. He was a professor, a lover of stories, and he was buildng her a library in the same way other men might build their daughters houses. The most important people in our lives elicit the strongest emotions and the broadest array of them. Sometimes we love them. Sometimes we hate them. Sometimes the love and hate are so inextricably intertwined, it's easier to give up than stick it out and find your way to peace. The Statistical Probability of Love at First Sight explores these themes of love and anguish in such unassuming and meaningful ways that I found myself pressing my hand to my chest the emotions were that true and close to the surface. What a beautiful way to start of a new year of reading. I do hope you seek it out. I downloaded a sample to my Kindle and was blown away. So now I want it in hardcover! Lin, I'm planning on picking mine up soon. I want to own this one. I pulled this one out of the piles of boxes that my books are currently in. Looks like I'm going to have to get to it sooner than later! Emily, how's your new place shaping up? That part with Hadley and Elephant and her dad and Charles Dickens was one of my favorites. And sigh, yes about too short of a time with Oliver after the plane touched down. This book has definitely stuck with me as well, and I liked how it was more than some fluffy romance. Also the comparison of Oliver to Cricket is SO APT. Angie, you are the queen of writing reviews that make me want to drop what I'm reading or re-read whatever book you've just reviewed. April, omg. That passage wins at everything. Cute boys next door (and on planes) FTW! Holly, LOL. Resistance is futile. Oh yes, I will be reading this book very soon, and your review has me even more excited to read it. Glad to hear that it's cute and sweet as the title suggests, but also makes you think. And, you had me at Cricket Bell. Lucy, it has it all. Ah, Cricket . . . I've really been wanting this book and that excerpt is making it even worse! Haha. It sounds so cute; I can't wait to get my hands on it! L.L., hope you like it! Oh my gosh, I love that last bit of the quote!!! Charlotte, it packs such a wow moment for me. I mean, WOW. This one sounds lovely, Angie! I love the scene that you quoted. I want to read the book just for that (and for the Cricket Bell comparison). I'm sorry I missed it on NetGalley. Chach, there are several like that one. They're perfect. I read the word statistic and blacked out. "e was giving her the most important thing he could, the only way he knew how. He was a professor, a lover of stories, and he was buildng her a library in the same way other men might build their daughters houses." That just melted my heart and sold me on this one, that right there. Love. No other words. bb, tears in my eyes. Tears. In. My. Eyes. Lin, oh good! You will not regret a hardcover purchase, IMO. Emily, I would. Think you'd really enjoy it. April, wasn't that just the most perfect scene?? It slayed me. I loved it for being more than it seemed. And for treating the two of them as mature individuals and not slaves to their hormones 24/7. Holly, hehehe. Well, he does! Lucy, hard to resist a Cricket-like dude, huh? L.L, that really was my favorite passage. But there are quite a few other gems as well. Charlotte, isn't it perfect? It hit me where I live, you know? Chachic, yeah, it seems like it wasn't on NG for long. I hope you find a copy soon. It's lovely. bb, right?!? I was a goner after that. This was available on Netgalley? Why am I the last one to know about these things!? Ah well, at least I really loved the book, so money well spent! One of the reasons I’m usually weary of YA is that the characters always behave like, well, teenagers, and I keep thinking that they should grow up, which is ridiculous of me because if I want the characters to behave like adults then I should pick a book about adults. But with this book, even though Hadley is immature and self-absorbed, I was able to see her point and to understand where she was coming from. I think Ms. Smith did a wonderful job at portraying the hurt and betrayal a person, and a teenager in particular, feels after a parent does what her dad did. I liked that Hadley was both precocious and immature, which is often the case with teenagers, and I was so glad there was no real insta-love, there was a lot of chemistry there but they were going through so much that the love story was like a life-saving afterthought, so it was more a beginning than an HEA. Brie, it was. Sometimes they're there and gone in the blink of an eye! I feel you with that conundrum. I think we all do that from time to time. Like you, I really understood Hadley's POV. I certainly didn't fault her. She really did a wonderful job with the entire story.